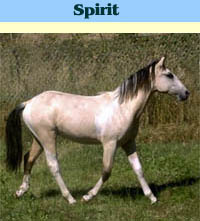 Spirit has a good disposition. Sire and Dam just under 14.2 hands. Leads, ties, loads, trailers - groundwork already done. Very reasonably priced at $2,500.00. It is hard to find a nice pony with the popular buckskin color, let alone pinto markings at this price!